Every year, I re-share a post I wrote a couple years ago, which includes my favorite recipes of most of the holiday goodies I make. Last weekend, my 15 year old step-son requested I make pumpkin bars. That’s saying a lot. He usually doesn’t ask for much of anything! Pumpkin bars, fresh out of the oven. They need to cool completely before frosting them. YUM! I thought I’d share the recipe of these delicious bars! The recipe comes from a previous co-worker, Ruth Hayek. We haven’t worked together in over 7 years, but I still have the recipe card she gave me, and think of her every time I make them! This recipe makes a 12 x 18 bar pan. Mix sugar, oil, eggs, and pumpkin in a large bowl. Sift remaining ingredients together and add to pumpkin mixture. Stir well. Pour into greased and floured jelly roll/bar pan. 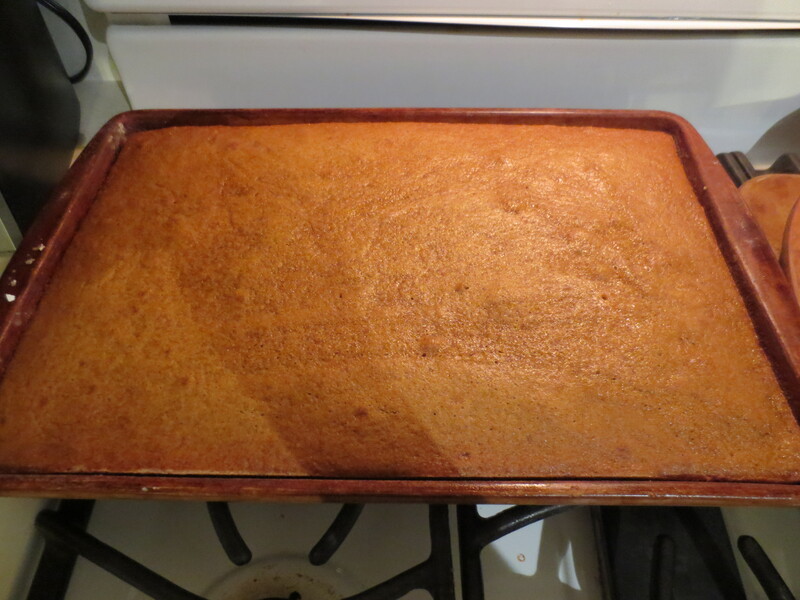 Bake at 350 degrees F for 20-25 minutes (until toothpick inserted in various areas comes out clean). Mix well with mixer, then frost bars. If you love pumpkin, and want something other than pumpkin pie, make these. You won’t be sorry! Previous Learn From my Rhinestoning Mistakes Next Master Classes – SO worth it!